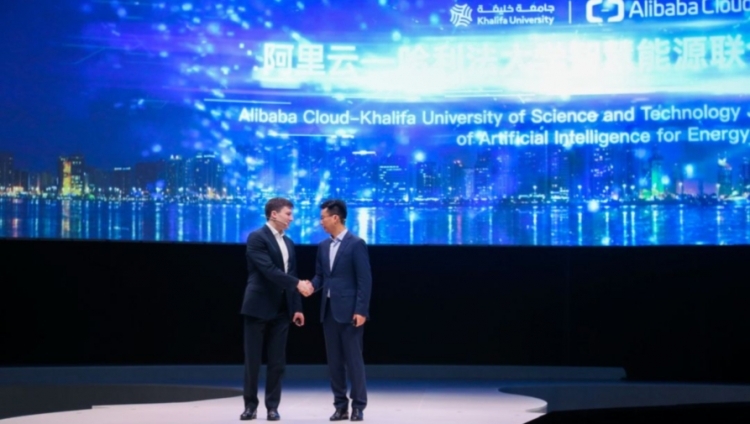 Khalifa University of Science and Technology and Alibaba Cloud, the cloud computing arm of Alibaba Group, have launched the Joint Innovation Laboratory of Artificial Intelligence for Clean Energy (“The Lab”), strengthening scientific cooperation between the two companies in the fields of energy and computer science. Both parties intend to leverage The Lab as their innovation hub for clean energy solutions, utilizing artificial intelligence (AI), cloud computing and big data technologies to develop future energy technologies and energy-saving materials. The launch was announced during the opening ceremony of the Computing Conference 2018 hosted by Alibaba in Hangzhou, China, from 19-22 September. Jack Ma, Executive Chairman of Alibaba Group, Daniel Zhang, the Chief Executive Officer of Alibaba Group, Simon Hu, President of Alibaba Cloud and Senior Vice President of Alibaba Group, Dr. Steve Griffiths, Senior Vice-President for Research and Development, Khalifa University, Dr. Tiejun Zhang, Associate Professor, Khalifa University, and Ahmed Al Kuttab, Head of the Executive Office of Abu Dhabi National Oil Company (ADNOC), attended the ceremony. The Lab will focus on three research themes – AI-enabled subsurface energy production and processing, machine learning-enabled clean energy materials development, and AI/cloud computing-powered smart renewable energy systems. Initial projects are expected to be rolled out from now until 2023. The projects will be sponsored by Alibaba Cloud and led by Dr. Zhang from Khalifa University as the principal scientist leading the research collaboration. Faculty and scientists from Khalifa University will provide their technical expertise to advance The Lab’s research effort while Alibaba Cloud will make available research scientists and specialists as well as advanced cloud computing resources to support The Lab’s development.